silver and jewellery distinguish it clearly from the work of other European nations, the bold decoration and unique forms developed by the Russian craftsmen epitomising the distinction in culture. It was in Kievan Rus, the great Slavic state founded at the end of the 10th century, that this originality first became evident, an originality now on fascinating display in Russia's principal museums. Christianity soon came to Kievan Rus, in 988 from Byzantium, bringing in its wake an influx of craftsmen skilled in many art forms, but most especially glorious cloisonne enamelling and the more subtle niello work. The ravages of the Mongol Golden Horde, in the 13th century, however, all but put paid to this tradition of highly decorated precious metal working, and it was not until the 16th century, when Ivan the Terrible had succeeded in expelling the last of the invaders, that the arts began to flourish again, now centred on the new capital of Moscow with its Tsarist rulers. Pieces from this period too are generally only to be found in museums and in major collections, but pieces from the 18th century onwards, when trade with the rest of the world was becoming established, are widely available to today's collectors, as well as those pieces inspired by the pan-Slavic movement which began early in the 19th century, in the reign of Nicholas I, and which led to the revival of the styles and techniques of ancient Holy Russia. Of the many hundreds of silversmiths known to be working in this vast country during this latter period ie the second half of the 19th century until the Revolution in 1917, one name has come to stand out from the rest - Carl Faberge, artist-designer par excellence, and supplier of fabulous objects to the Tsarist court. For the collector of Russian silver, however, it important to bear in mind that, in the Russia of that time, Faberge was only one of a number of silversmithing firms who held the coveted Imperial Warrant, firms whose work was of the same superb quality and whose pieces are now much sought after: Ovchinnikov, Sazikov, Khlebnikov, Grachev, Morozov, Gubkin,Saltykov,Sokolov,Kurlyukov,etc. And even beyond these are many, many artists whose work would grace any collection, and who are recorded, with honour, in reference books on Russian silver - Saltykov, Klingert, Semenov, Semenova, Zverev, Kuzmichev, Agafonov, Lyubavin, Alexiev, Adler, the Moscow Artels etc. 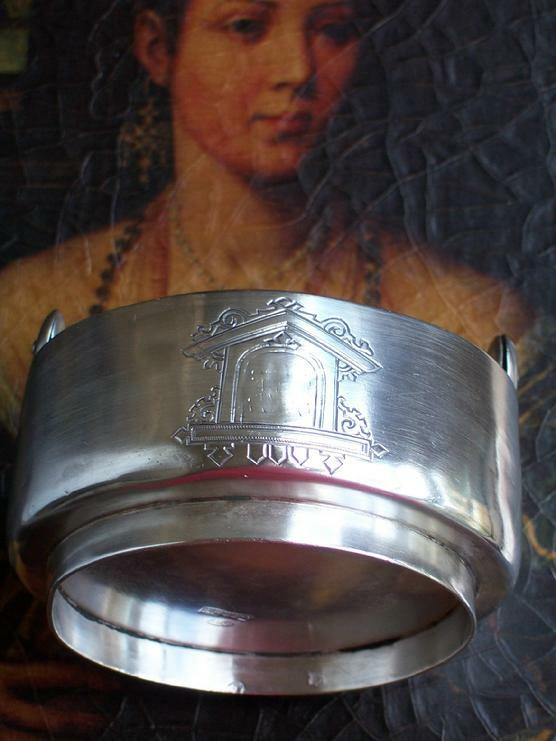 Though its silversmithing industry was long producing objects in great quantity and of a quality not surpassed anywhere in Europe, up until 1613 the marking of silver articles was not compulsory in Russia, and even then it was only in Moscow that it was made mandatory. In 1700, however, Peter the Great, fresh from his extensive travels in western Europe, and bent on bringing reform to all aspects of the Russian nation, began a full-scale re-organisation of the marking system. It was made compulsory for the silversmith to stamp his mark, and for the minimum gold and silver standards to be guaranteed. Until 1798 this last standard mark was optional, and if it was omitted then the alderman's mark would be added, in order to guarantee the quality of the piece. A further re-organisation of the system took place in 1896, bringing in the era of the kokoshnik marks. 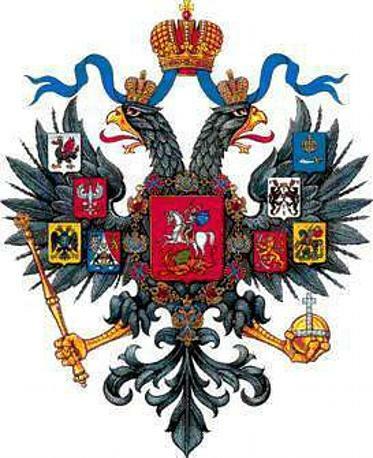 This name derives from the fact that the mark features a female head, wearing the traditional Russian headress, the kokoshnik, originally made of stiffened cloth, which later evolved, in Court circles, into the familiar jewelled ornament, the tiara Russe. From 1896 until 1908, the period of the first kokoshnik mark, silver articles were marked with this female head, facing to the left, with a number representing the silver standard to her left, and to her right the initials of the assay master (very tiny), all within an oval outline. The maker's mark is also found nearby, as shown below. 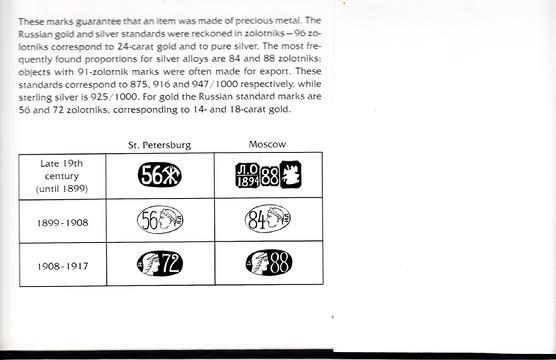 In 1908 the second kokoshnik mark was introduced, this time with the female head facing to the right, with a small Greek letter signifying the city of assay to the left eg alpha for St Petersburg, and delta for Moscow, and the silver standard to the right. This mark was used until the Revolution in 1917, and somewhat beyond, until the establishment of the full Soviet system.